Amazon Price: $39.99 (as of February 8, 2019 10:30 pm – Details). Product prices and availability are accurate as of the date/time indicated and are subject to change. Any price and availability information displayed on the Amazon site at the time of purchase will apply to the purchase of this product. Put Domo’s face on your bread, english muffin, bagel, breakfast pastry, pancake, waffles, the sky is the limit! 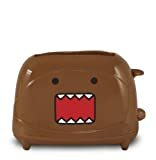 Be the first on your block to have the Domo Toaster! Below are more options to purchase this toaster!